Seven men who carried out a series of armed robberies in southern England, which ended when police shot dead two gang members, have been jailed. 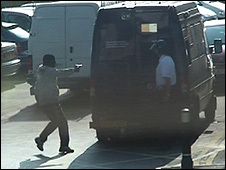 Kingston Crown Court heard how the gang took about £500,000 by robbing security vans making deliveries to banks. Their 18-month campaign ended when the gang leaders were shot dead by armed officers outside a bank in Hampshire. Getaway driver Terence Wallace, 26, and fellow gang member Adrian Johnson, 28, got the longest sentences of 17 years. The robberies took place at 18 locations in Oxford, Swindon, Bristol, Bath, Cambridgeshire, Hampshire, Reading, Ipswich and Gloucestershire between April 2006 and September 2007. The spree came to an end when police shot dead ringleader Mark Nunes, 35, and 36-year-old accomplice Andrew Markland during a foiled raid in Chandler's Ford, Hampshire, in September 2007. 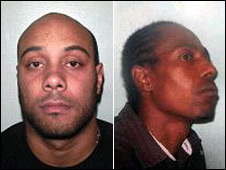 Wallace, from Raynes Park, and Johnson, from Streatham Hill, both in London, had denied conspiracy to rob. Johnson was also convicted of a separate cashbox robbery committed last November after Nunes was shot dead. When the sentence was handed down, the mother of Wallace's two children left the court in tears, swearing at the judge. Leroy Wilkinson, 29, from Streatham in London, who had also denied the charge, was jailed for 12 years. 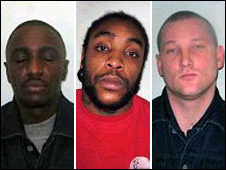 Three men - Leroy Hall, 32, Leon McKenzie, 28, and Brian Henry, 32 - all from London - were given reduced sentences for pleading guilty to being part of the gang. 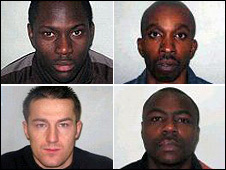 Hall and McKenzie were given seven-year sentences and Henry was jailed for six-and-a-half years. Victor Iniodu, 34, from Tooting, London, who had denied conspiracy to rob, received a five-year sentence. During the trial, the jury was told that mobile telephone records of the gang members placed them at the scene of a series of bank raids, exactly a week before the crimes. Their phones would then be switched off during the robberies. The prosecution also said the phone records showed defendants had all been in contact with Nunes, who was the recruiter for the gang. 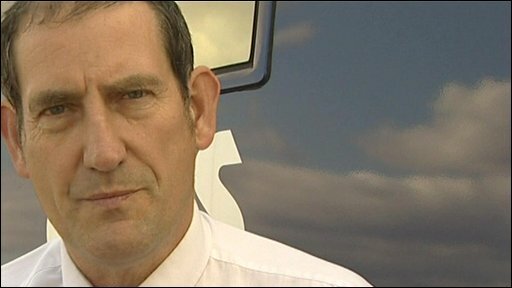 Judge Richard Southwell said the robberies were "highly organised and carefully planned". Most of the raids occurred outside the M25, as the guards delivered cashboxes to small banks. Afterwards, officers from the Metropolitan Police's Flying Squad said the sentences - which were more severe than they had expected - sent out a strong warning. Det Insp Terry Wilson, said: "The sentences send out a very clear message to those thinking of becoming involved in such criminal networks." One security guard, Colin Frewer, was targeted on two separate occasions, both at Colchester. The judge commended him for lashing out at the attackers during one raid, even though one was carrying a gun. A shot was fired, but no one was hurt. He was awarded him £750 from public funds in recognition of his "conspicuous piece of courage". Mr Frewer, 64, told the BBC that his patience "just snapped" and he went for it. "It gave me a good feeling to hear the judge praise me," he added. Another member of the public was given an award of £250 for "body-checking" one of the gang as they attempted to make a getaway.